This horse can be seen at Cedar Point amusement park in Sandusky, Ohio. This is a Third Edition Tobin Fraley, produced in 1989. This piece came with an oak music-box base with a Wurlitzer band organ backpiece. It was also offered with a small slightly curved brass base, in a smaller size than this one - as well as being offered in the First Edition with a rocking-horse base and also appearing on that edition's large four-horse carousel. 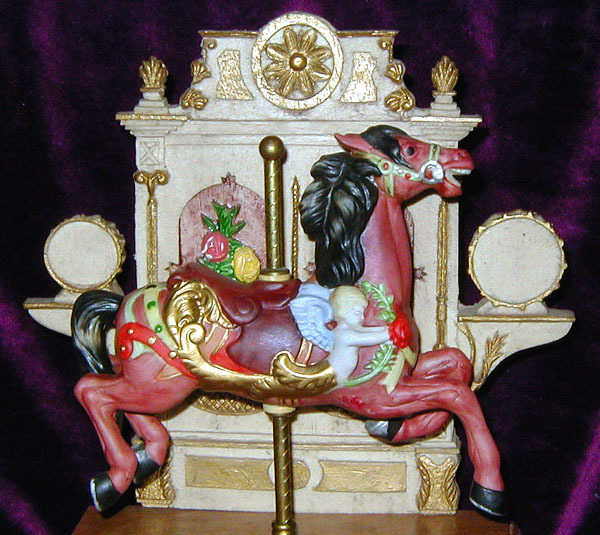 This piece is about 10" to the top of the backpiece, and the horse moves up and down as the music box plays. Each base configuration was limited to a run of 4500. I am not sure what these pieces went for when new.